Since I've done this race six times now (this entry, 2012, 2011, 2010, 2008, and 2007... whew!! ), I am going to reflect rather than talk about course details, which you can catch... maybe... in my past recaps. Compared to last year's solid finish in this race, I am pretty disappointed with my performance in the LA Marathon this year -- particularly because I had actually been putting in some legitimate training. I can't really pinpoint what happened -- recent illnesses, new routines, etc.? -- but when it comes to races, it sometimes just comes down to random little things that can negate weeks of training. 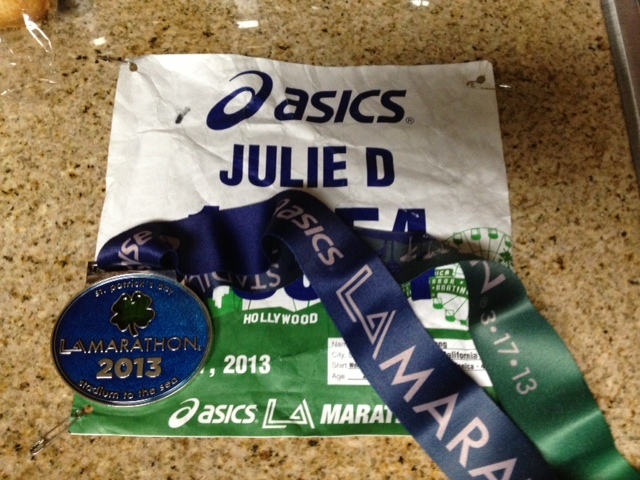 Or, I guess it was an unlucky 13(th marathon) for me. First of all, I guess I was out of it. Even after having this photo snapped of me at the expo, I failed to notice that I was not in a seeded corral, like I had in previous years. Had I noticed "The Ukrainian"'s bib number, I would have seen that he had a letter in front of his number. So on race morning, while I was shivering at Dodger Stadium, waiting for the race to start, I became agitated with the fact that I'd be starting in the general corral... even more agitated when I overheard people whose previous marathon times were slower than mine. I used my Ojai time (4:22), registered within the first hour that the race registration opened, and definitely felt I was within the top 10,000 times to qualify for a corral. I concluded that they messed up, but I am at fault for not noticing this at the expo. Anyway, that kind of started my morning off on the wrong foot, so to speak, and as expected, the starting area was very hectic. Still, I only had to wait six minutes to cross the start line, dodging a bunch of people like expected. The weather forecasts had stated that there'd be a marine layer, but it broke up early, and I was definitely sweating a lot in the first half. It was kind of muggy. I was using my walk/run strategy (a variant of Galloway) that has already worked twice for me, but even in the first half, I felt like the miles were going slowly, I was tiring quickly, and my legs were a bit tight. I was drinking a lot to offset this -- water and sports drink that I was carrying. Still, I thought things were going pretty well until after Mile 20, as most runners probably experience. I was spent by then. I was smiling at this finish-line shot, somehow. Check out my green-ish St. Patty's Day socks. Around Mile 22, while I was dragging, my calf seized up all of a sudden -- no warning twitch, no nothing. Trying to prevent pulling it completely, I stopped in my tracks and calmly massaged my calf. The bulging muscle subsided and then swelled again. I waited until it completely stopped before attempting to move over to the side, where it started happening again. Luckily, I was able to prevent what surely would have been a limpy ending. I credit my not freaking out. However, I couldn't run anymore. Every time I tried, I felt I was about to pull something, so I had the frustrating task of walking the last four miles as quickly as I could. The last two times I used the run/walk method, I was able to keep myself from this fate, so I don't really know what happened this time. As I approached the end, I couldn't even run in front of all those spectators without worrying about injuring myself in front of everyone. I did manage to kind of run the last .05 mi or so (only because I was desperate to break 4:50), but it was really disappointing to finish this way. Given that my next marathon is in two months, I am not letting this less-than-ideal result bother me too much. 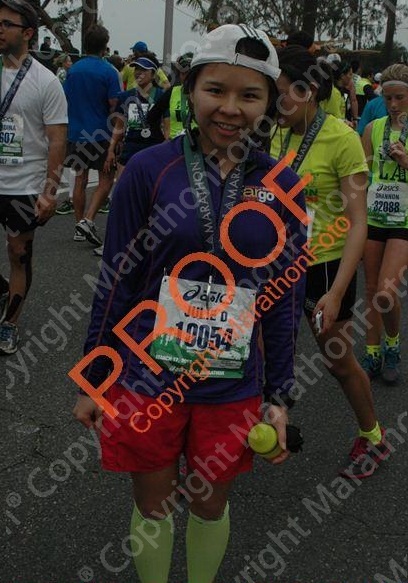 I think I've become accustomed to things not going as planned, and since I just started a new job, I am reminded of how amazing people think marathoning is, regardless of finish time. Not like I'm trying to be complacent, though! 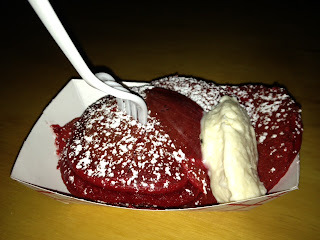 Red Velvet pancakes from The Buttermilk Truck, which had alluded me for years. 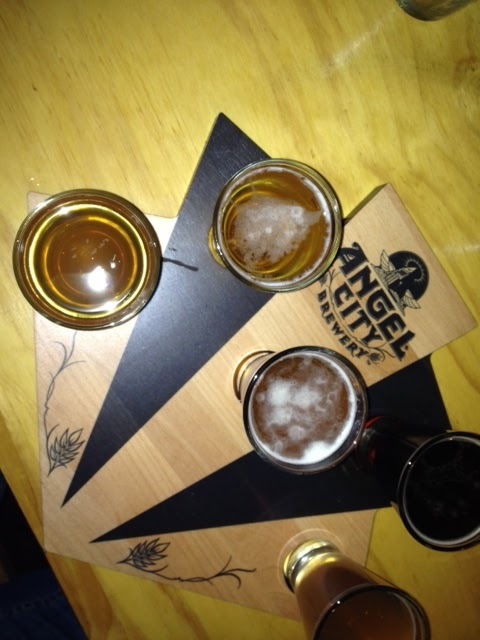 Angel City Brewery beer flight. As for my journey to my next marathon... that hasn't been fully decided yet. To be continued, I guess. This post is dedicated to the LA Marathon, which is less than a week away tomorrow (took too long to get this post live, so hmmm)! Having skipped my last long run last weekend, I definitely have some anxiety. 1) Get sick for 50% of the month before the race. The first was a cold that I caught on the subway... the second from "The Ukrainian" two weeks later. Awful, awful. Although I'm mostly well now, I don't know if my lungs sustained any "permanent damage." In addition, and maybe unrelated, my skin has been incredibly dry lately... even with lotion. Same with my lips, but there's these cute cake-flavored Chapsticks for that. I have to be careful with new lip products due to random allergic reactions I can get, but this one seems to be fine (as well as calorie-free, ha ha). I was sent this party kit with it, which I'm hoping to utilize at some point when I'm less busy and more healthy. Mmmm, cupcakes. ChapStick® Velvet Cupcake and Cake Batter varieties are available now until approximately March 31st exclusively at Wal-Mart, CVS and Walgreens nationwide. 2) Start a new job, new routine, and then endure daylight savings time to boot. My routine results in swollen feet and legs daily, along with less sleep. (Does anyone have any recommendations for comfy heel-ish work shoes that come in wide-widths that don't look hideous??) However, I do enjoy the new gig and am looking forward to all of its challenges. Everything definitely seems more rushed now, and I've definitely been falling behind on all things blogging.... but hopefully, that will pass. Okay, so I did do a 17.5-miler, a couple of 12.5s, and a 20, so maybe this can be called "tapering." My new schedule results in less workout time, though I have spent the majority of those times running (3-4 mi) and such. 4) Obsess about other things besides running. "The Ukrainian" and I decided to finally do something we've wanted to do for a while, which is start an herb garden on our balcony. Since I took so long to write this post, I will say that we did get some growth and will be transferring the little guys to their new "beds" when we're supposed to be carbo-loading. Racing used to be something my life would work around, but it seems as though I now just plug it in wherever it will fit. My race schedule is definitely barren this year... although on my side bar, check out my next marathon coming in.... aggh... two months?! Be back soon with a race report! FTC Disclaimer: I was sent a sample of Chapstick and was not compensated to provide a positive opinion.